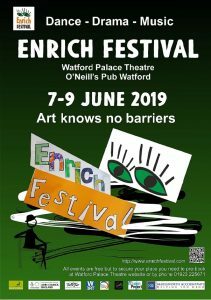 Enrich Festival is a three-day event (7th of June to the 9th of June, 2019) in Watford created to give space and visibility to amateur and professional artists with learning disabilities, break down social barriers and challenge misconceptions. Learning disabled artists make a vital contribution to the world we live and their work needs to be promoted, recognised and valued. Using visual and performing arts will provide an outlet for expression and an opportunity for the artists and the audience to engage in new activities and forge links with their wider community. Tickets are available for free but you need to pre-register before attending.